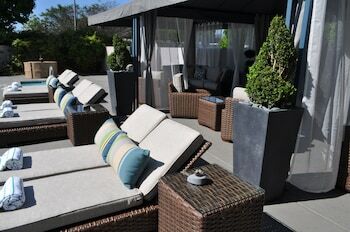 You may still be able to book by calling the hotel at 408-247-0800. 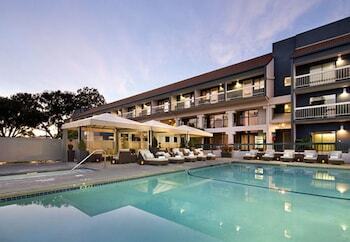 Located on a busy street full of strip malls, the Domain Hotel is unfortunately easy to miss. However, once you're inside, you'll wonder how you could've ever missed such a hip and beautifully designed hotel. Rooms are available in two themes: tranquility and awakening. Tranquility rooms have a calming blue palette, water-like swirl decorations on the walls and the faint scent of lavender to calm frazzled nerves. Awakening rooms don a green color scheme, a forest backdrop and the smell of lemongrass that tingles the nostrils. Rooms feature flatscreen TVs, iPod-docking stations and roomy desks. Also, most have a Sleep Number bed that will help you take full advantage of those relaxing rooms. Whether you feel awakened or tranquil, you definitely have to eat, so head to Bytes Cafe and Bar in the lobby. Enjoy a nice glass of wine in the cozy little bar or fuel up on house-made pizza and truffle-salt fries to get you through that long day of Silicon Valley living. 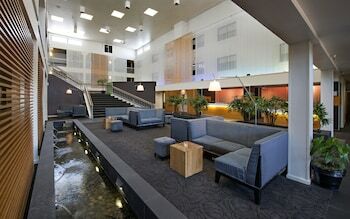 The Domain Hotel is a 3.5-star hotel located at 1085 E El Camino Real, Sunnyvale, CA 94087, US . Its nightly price usually falls between $89.1 per night and $729 per night, excluding tax, depending on room category. At The Domain Hotel, AAA members often get 7-13% off the regular rate. For example, on January 2, 2019, a AAA rate of $113.05 per night was offered. Depending on your itinerary, your savings can be more than the annual AAA membership fee itself! Many Room 77 users are able to pay for their entire AAA membership in a single stay. 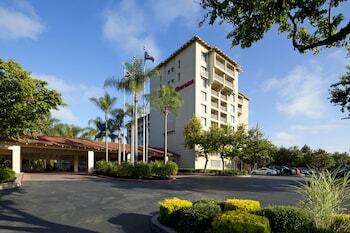 At The Domain Hotel, seniors often get 5-10% off the regular rate. For example, on January 2, 2019, a senior rate of $113.05 per night was offered. $89 per night found for a Central Room room type. For January 2, 2019, a special AAA rate of $113.05 per night was found for the AAA Rate - 1king 364 Sqft With 32 Inch Lcd Ipod Docking room type. For January 2, 2019, a special Senior rate of $113.05 per night was found for the AARP Rate - 1king 364 Sqft With 32 Inch Lcd Ipod Docking room type. The Domain Hotel sells rooms through sites like Room 77, Expedia, Hotels.com, GetARoom, and many others. Room 77 searches across dozens of different sites to find the lowest discount rates available. The lowest rate we've seen over the last few weeks was found on . In 1% of the cases we surveyed, all sites offered the same rate. You can compare real-time rates from all of these sites on Room 77. Room 77 is the only hotel shopping site that includes special discounts like AAA, senior, government, military, and corporate rates.